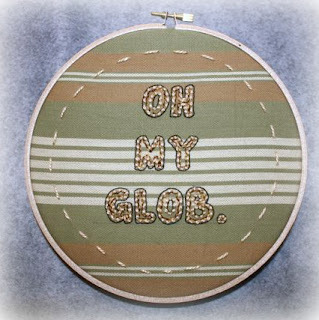 The Cotton Floozy: Thank Glob It's Friday! I actually have little to no concept of the days of the week in the summertime. I work at my job randomly and as needed. My kids aren't in any organized sports (woohoo!) and when they do participate in outside-the-home activities like space camp and children's birthday parties, the dates and times are erratic. Summer is all just a blur of dentist appointments, eye appointments, and evil waterpark appointments. But today I am saying Thank Glob It's Friday!, less about the day and more about the weather. It's raining! And yes, I know that I am a conundrum. I hate water from swimming pools and water slides, but when water comes from the sky and plasters me wet, I AM SO HAPPY. It has been so depressingly dry and sunshiny these past few days, that it is a blessing to have such gloomy skies and a soaking respite. 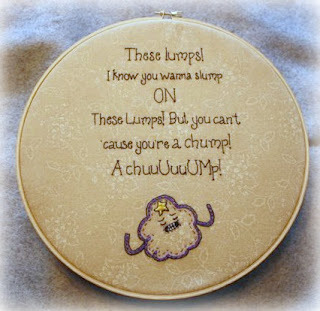 Lumpy Space Princess brings it! Rain. I love you. I know that the main reason I have to thank you is because of LSP (Lumpy Space Princess) and her awesome lumps that everyone wants to slump on. Slumping on LSP's lumps makes rain. That's science. THANK YOU SCIENCE AND LSP! I occasionally see fan-offs between Adventure Time and The Regular Show. Team Ice King or Team Pops? Muscle Man or LSP? Mr. Floozy is Team Pops. I am Team Ice King all the way. What team do you belong to? I feel as if you are speaking some sort of alien language right now. But that's ok, because I'm still entertained. And hopefully you come in peace. I am team LSP. I want it SO MUCH that it almost hurts a little. You are the queen. Oh yeah, duh. I am totally making one for you once Craft Lake City is over (less than a month) and I am no longer a one woman sweatshop. hahahah I approve of this plan!! I just came to Adventure Time a few months ago, and am now OBSESSED with it. It is freakin' brilliant. 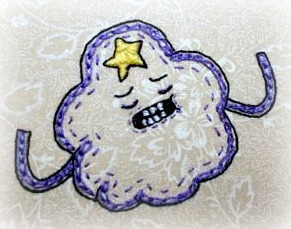 And I love Lumpy Space Princess and her lumps so much I can barely stand it. I'm a team Gunter fan, how can you go wrong with an army of freaky penguins behind you?